Chanterelle, Karen and David Waltuck’s beautiful TriBeCa restaurant, hosted a series of Sunday Salons a few years back. They were some of the best food-related events I had ever been to. An exploration of food and art, the topics ranged from blues and beer to poetry and cocktails to Champagne and caviar (this was an especially decadent one). With the sad closing of Chanterelle in the fall of 2009, we at L’Ecole have decided to carry on their tradition. The pairing of cheese and wine is well-charted territory. 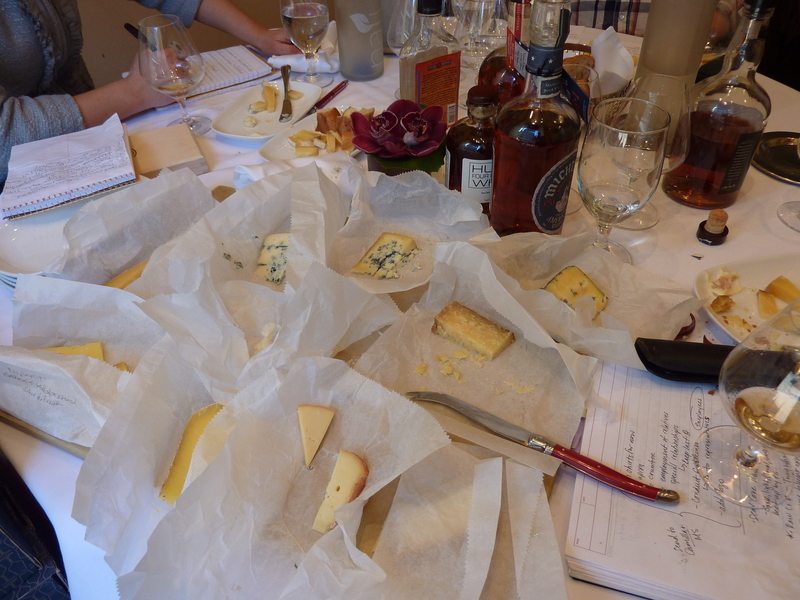 Our guests speak to a more contemporary question: can American whiskey pair with artisanal cheese? Anne Saxelby opened Saxelby Cheesemongers in 2006. Located in NYC’s Lower East Side in the Essex Market, the shop offers a premier selection of domestic artisanal cheeses and hosts regular tasting events. Ethan Kelley is a spirits educator with over 17 years experience behind the bar. He’s created menus for notable bars and restaurants, including The Brandy Library where he was formerly the beverage director. Prep work for our upcoming event. Hope to see you there!